TRASK FAMILY: Finally caught some smiles!! 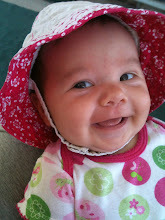 We had a great "smiles" session at grandma's just a few days ago. He'd had a long nap & a full stomach & was finally ready to smile for the camera. He's starting to get the hang of it!! I'm just too cute, don't you think?? Enough with the flash mom, isn't 20+ pics plenty?? He does look a lot like Mark when he smiles! Adorable!! I miss him! Hey Jennette, Mark, and Troy! Troy looks so cute in all of those pictures!!! He looks just like Mark, I can't believe it.